International Year of the Reef 2018 has come to a close, but Celebrating Singapore Shores will go on! 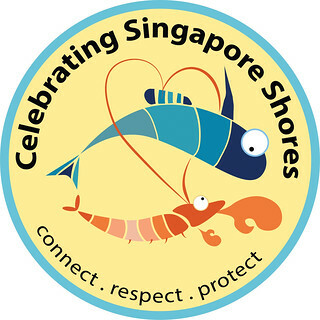 Here is our new Celebrating Singapore Shores Forever logo. The new logo will be unveiled on 16 Mar (Sat) at Celebrating Singapore Shores at Berlayar Creek Boardwalk. This evening event (4pm - 8pm) is FREE, no registration required. Specially for kids and the family with games and prizes, nature walks and films. Berlayar Creek boardwalk is next to Labrador MRT station. The event will take you from the mangroves there to the corals at Marina at Keppel Bay. Hear the snapping shrimps at the Hydrophone Project, National University of Singapore booth! 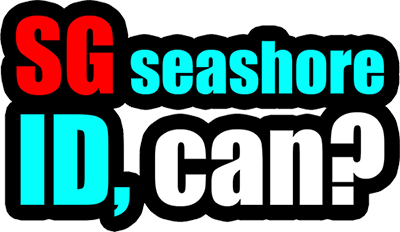 Learn about the natural sounds of our seas, their causes and uses! Find out more about basic bioacoustics, the instrumentation and smartphone applications used. Hear the chorus of snapping shrimps, the sounds of waves, as well as the loud noises emitted by passing ships. 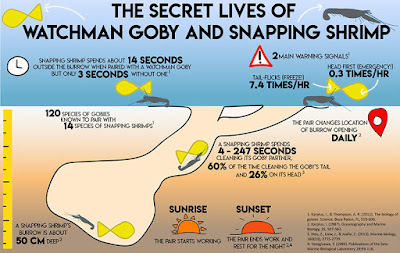 The logo features a snapping shrimp and a small fish - the shrimp goby. These two different animals live together in harmony. Here is their story! GoGo the Goby was looking for a new home. GoGo came across Snappy the Snapping Shrimp digging its burrow. However, before GoGo could ask, a dark shadow appeared! It was a big fish! GoGo swam headfirst into Snappy’s burrow. Snappy had bad eyesight but his antennae were very sensitive. It felt GoGo enter its burrow, and went in to confront the intruder. ‘HEY! Who are you and what are you doing in my burrow! ?’ demanded Snappy. ‘I’m GoGo the Goby and I saved you from a big fish right outside the burrow!’ replied GoGo. ‘Oh thank you GoGo! What are you doing here anyway?’ asked Snappy. ‘I’m looking for a new home! Could I stay here with you? I’ll bring you food and tell you when big fishes are coming!’ cried GoGo. 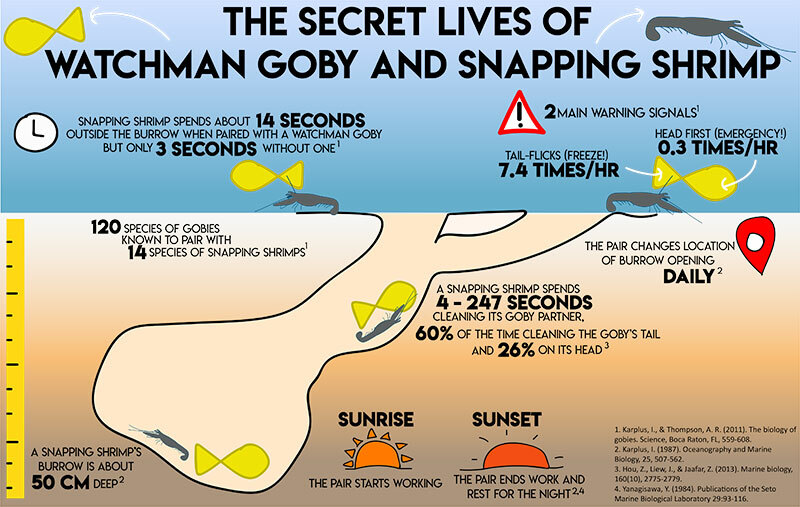 Till this day, GoGo and Snappy live happily together, collecting materials to build their burrow and hiding in their burrow when predators appear.